Against the background of Nigeria’s economic vulnerability, President of Dangote Group, Aliko Dangote, has said the current efforts of the Federal Government at diversifying the economy to an agriculture-centred one remains the viable solution to creating a healthy economy. Dangote, who was spoke weekend in his office, during a meeting with some Asian businessmen, in Lagos, said his belief in government’s approach at re-energising the economy, and making it export-oriented made him step up his investment in agriculture especially in the area of food sufficiency. According to him, Nigeria has wasted huge foreign exchange importing foods that ordinarily should be produced locally, and even exported, and until a new approach at redirecting the economy from import-dependent to an export one, which the present government is leading, no meaningful change can happen. He said; “We have invested massively in rice, sugar, dairy products, and tomatoes. Our rice-out grower scheme will produce rice by next year, and that will reduce our rice import to nearly zero, because Nigeria imports more than half of the rice it consumes. We have expanded our sugar operations with our operations in Tonga in Nasarawa, in addition to Numan sugar projects where sugarcane is cultivated and planted for raw sugar production that will be refined. “Some months ago, we laid the foundation for the construction of ultra-modern rice processing integrated plant that will process 16 metric tonnes of paddy rice in one hour. By the time you multiply this by the number of hours and days it operates, you will understand that this is huge. The interesting thing about investment in agric is that apart from food production sufficiency, the job potential is unquantifiable. 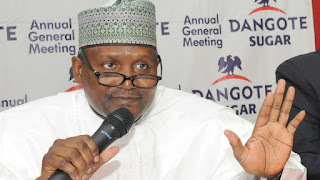 Dangote told his guests that his company was investing massively in agribusiness, promoting industrialisation through backward integration process to ensure Nigeria becomes self-reliant in food production in good time, and save it the much-needed foreign exchange hitherto being spent on importation. He added that, “We are producing the raw materials needed in our factories. In the sugar sector, we developed a sugar backward integration project plan targeted at the production of 1.5MT/PA from various sites across Nigeria, in the next 10 years. “We have an out-grower scheme; enough paddy rice will be grown and harvested for processing. Some 20,000 out-growers are expected to produce an average of 180,000 tonnes of paddy rice. We are presently building rice processing mills in Kano, Jigawa, Sokoto, Zamfara, Kebbi, and Niger states in the first phase,” he added. With these investments, he noted that Dangote Rice Company will become the largest rice producer in Africa; a bold step in making Nigeria self-sufficient in rice production.